St Gregory's, Tredington, is a large and spacious church with much history behind it. Its glorious 200ft spire can be seen for miles around. It was once the centre of a parish that extended from Newbold-on-Stour in the north to the edge of Todenham in the south, with Shipston in the middle. 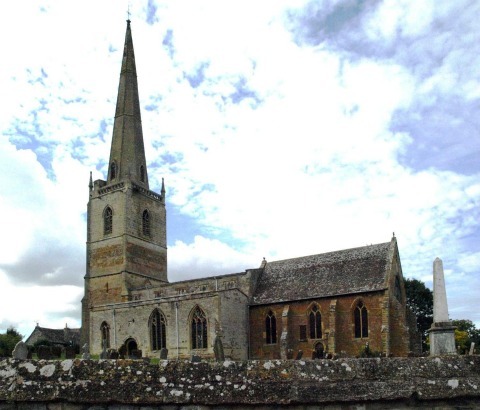 The original church was founded in 961 and came under the jurisdiction of the Bishops of Worcester, which resulted in Tredington being in Worcestershire until the boundary changes of 1932. An unusual piece of history meets you on entering the church: musket ball holes in the North door! These occurred during the Civil War, although the reason for doing this is unclear. Inside, the pews are worth inspecting, as they are late C15th: very ancient indeed. Another gem is the Jacobean pulpit, complete with magnificently-carved sounding board. There are some ancient brasses, two set into the west wall of the North Aisle (both were originally set into the floor) and one in the South Aisle floor. Looking upwards to the West wall of the South Aisle, one can view what remains of the C17th wall murals that used to adorn the Church. Looking up at the Nave walls, below the clerestory windows, reveals some very interesting stonework: parts of the arches of the windows of the Saxon building. Further and more extensive Saxon stonework can be viewed in the wall opposite the South Door. One item you will not see in St Gregory's is a pipe organ - and there seems to be no record of one ever existing. An electric organ suffices. The tower and spire are C14th. The structure was built apart from the Nave and then joined by extending the Nave. The 6 bells (16-1-20) are rung from the ground floor and go fairly slowly. The back 4 bells are unusual for this area, being cast by George Purdue and Robert Atton in 1622 and 1624. Matthew Bagley provided the treble in 1683. 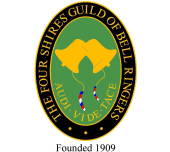 The 3rd is a Mears bell of 1858 and clearly replaced an earlier bell. The tenor has an unusually deep note for its weight, being slightly sharp of D. The Guild has a practice here on Saturday August 20th.